LUSH: Secret Wine | Lush Wine Blog: Read it. Drink it. I love contests. I am fairly competitive, and always love a good game and friendly challenges. And, if wine is involved, all the better. Thus, when Ms. Cara of Decant Chicago blog mentioned the Secret Wine contest, I just couldn’t resist. Exhilarating! The simple rules involved registering as one of the first 85 bloggers, eagerly awaiting 3 bottles of blind wine, and then voting. At stake, a trip to France! Awesome. I am SO in. And game. 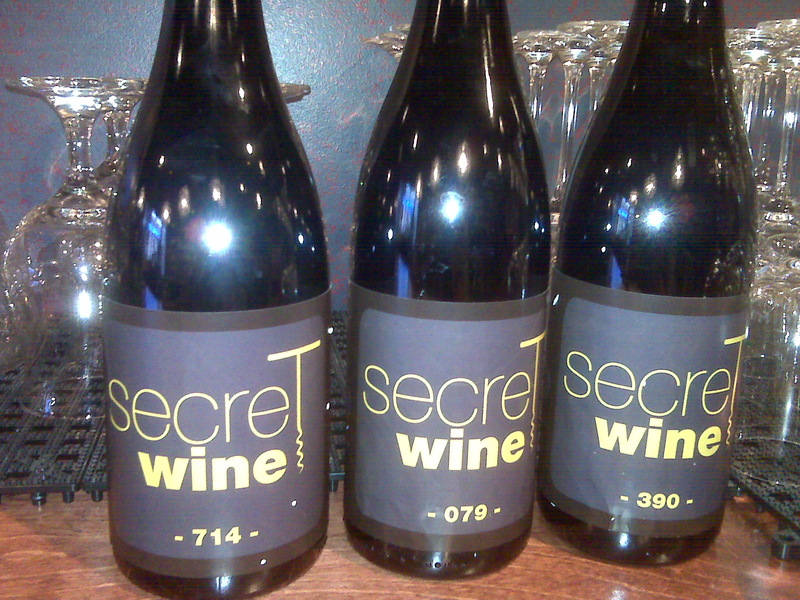 The wine arrived, re-bottled, re-corked, and labeled with ‘Secret Wine’ and a number. Instructions were to guess the appellation. Just the appellation. Not the grapes, or the year, or the producer. Seems simple, right? Not so much. After completing some very brief research into the host company, Clare de Lune, a French wine PR company, I surmised that the wines are most likely from the regions the company represents in France. However, even with all that narrowing down and focus, it is still extremely difficult to pick just one. And, yes, I am also well aware that making assumptions when blind tasting is involved is risky business. The contest is still running, but we have been encouraged to share, in detail, our tasting experience and reasoning process. Much tasting. Very fun. And surprising. One vote only. Apparently, all guesses thus far are not quite correct. So, the waiting continues while the remaining bloggers catch up and vote. Until then…the wines are still secret. Wine #714: This wine, visually, stood out from the other two. Possibly a trick to manipulate the mind, possibly just a coincidence. I loosely followed the Court of Master Sommeliers blind tasting process, beginning with visual clues and then aromatics, and finally on to taste and conclusion. Sight – Brilliant. Ruby red with magenta and pink. Concentrated. Medium plus viscosity. Nose – Medium intensity. Smashed fresh strawberry and strawberry preserves, raspberry, and cherry liqueur. Cinnamon stick. Almond cream and vanilla. A subtle hint of mineral. Youthful wine. Palate – Dry, but very ripe. Mirrored aromatic fruits, but with more pronounced sweet cherry and smashed fresh strawberry. Wild flower and rose petal, wilted. Again, a touch of minerality. Medium plus body, medium acid, medium tannin (probably fruit and older wood). Big, but balanced. Finish is softer and fruit dominate. Initial Conclusion – Old World, warm climate, Grenache (possibly another red fruit driven grape, Carignan, Mourvedre?, sandy soil? ), Southern Rhone, France, 1-3 years. Wine #079 This was the first wine I tasted of the series. A bit less expressive, but definitely tricky. Sight – Bright. Red, with just a slight tinge of magenta trending into the purple spectrum. Medium viscosity. Nose – Medium. Aromatics of roses and purple flowers. Pomegranate, cherries, raspberry jelly. Crushed mineral. Some peppery spice after it opened up. No obvious oak. Youthful. Palate – Dry. Flowers (smashed and covered with a bit of mud). Tart red fruit; cherries and pomegranate, raspberry. Earthy notes, dirt and leaves, bark. Medium plus alcohol, medium body, high acidity, and medium tannin. Tart, furry tannin and acidic finish. Initial conclusion – Old World, warm climate with cool nights or elevation. Cabernet Franc, Carignan, possibly some Syrah and Grenache. Blend suspected. France. 2-4 years. Wine #390 Final wine in the tasting series. Also a bit tricky. Sensing a trend? This was possibly my favorite to sip, in the subjective spectrum of things. But, back to the objective. Sight – Bright. Deeper toned than others. More garnet with purple accents. Medium plus viscosity. Nose – Medium plus. Aromas of blackberry, black plum, fig. Crushed lavender. Dirt, mushrooms and a bit of game meat. Old musty wood planks and a bit of vanilla. Some dried herb. Youthful. Palate – Flavors of candied violet flower, black plum, blackberry. Plush fruit. Savauge. Tobbaco leaf, herbs, vanilla bean. Medium body, medium acidity. Medium plus tannin. More weight and concentration. Long finish. Initial conclusions – Old world. Warm climate, some elevation. Syrah, maybe Mourvedre, Cabernet Franc. Final conclusions – Really want to say this is Loire Cabernet Franc. Bad. But the color is just too purple. And pepper is not really showing. But the way it feels is Cab Franc. Alas. Back to the notes and the process. Purple and earth and funk leads me to Syrah. Missing the pepper, though. Maybe a Bandol or, wilder yet, a Cahors. But, maybe a cooler vintage or an elevated vineyard. I recently tasted a Crozes-Hermitage that tasted similar, and thus I took that jump and made a guess. Really wanted to call it a Loire. Even researched the Cote Roannaise, and although aged examples could show such earthy notes, Pinot Noir and Gamay just shouldn’t have this sort of concentration of color and tannin. Fun game. Wish I was better at nailing it down and being decisive and confident. Always a good time. Lovely.